Feature| Herbalife Asia-Pacific Wellness Tour: Time To Make That Lifestyle Change! I wonder what do you do lasses to keep yourself healthy and well? The hubhub and I have made some changes in our diet to somehow help us with our health needs. We have completely switched over to Organic brown rice for the whole family, we have started to include more vegetables in our diet and we are finding ways to do workouts at home. Survey results based on the poll conducted by Herbalife and YouGov. 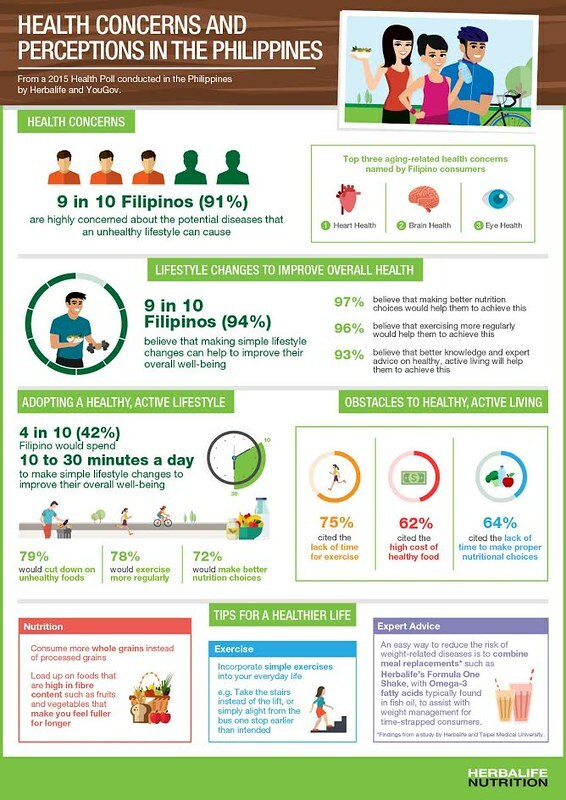 Herbalife, a global nutirtion company, recently conducted a survey which showed that 9 out of 10 filipinos are concerned about the potential diseases that an unhealthy lifestyle can cause, they also believe that simple lifestyle changes can actually help improve their overall well-being. How can you plan for a practical healthy lifestyle? Join the Herbalife Asia-Pacific Wellness Tour, which is on it's fourth year! In the past 3 years with 60,000 participants across the region this tour has helped deepen the understanding of the different aspects to living a healthy lifestyle. These five members of the Herbalife Nutrition Advisory Board (NAB) will be visiting 14 markets and 21 cities across the Asia-Pacific in the month of October and share their expert views on you can make use of your valuable time to make simple lifestyle changes to a better being. Dr. Heber, who is the founding Director of the UCLA Center for Human Nutrition at the University of California, Los Angeles, will be conducting a symposium for free to Filipino medical practitioners on October 23, 9am, at the Manila Hotel. The symposium will gather a group of 100 doctors, nurses, physical therapists and medical practitioners. The title of the symposium is “Obesity: More Than Just Being Overweight and Nutrition Forecast for 2020.” Seminars of Dr. Heber are recognized by US hospitals as part of Continuing Education Studies, which are often required of applicants. The following day, Oct. 24, Dr. Heber will be holding seminars for thousands of Herbalife Independent Members in the same hotel. About Herbalife Herbalife is a 35-year-old global nutrition company that sells weight-management, nutrition and personal care products intended to support a healthy lifestyle. Herbalife products are sold in more than 90 countries to and through a network of independent members. The company supports the Herbalife Family Foundation and its Casa Herbalife program to help bring good nutrition to children. To learn more visit Herbalife.com.